Although we didn't have it as much as I would have liked this Summer. I do love it though. Especially from my favorite farm, that I have been going to ever since I was a little girl with my Grandmother. We had the best sweet corn this year in out area! I’m doing my rounds and just wanted to pop by and thank you for commenting at my blog last month (August). I appreciate your input. I love corn. The corn here didn't grow to well as we didn't have a whole lotta rain this summer. I love fresh sweet born. Corn is my most favorite thing about summer ever. Last week we tried it grilled with mayo/parmesan cheese and it was so unbelievably fantastic! that just made my mouth water! What a pretty piece of corn! That is a great photograph. 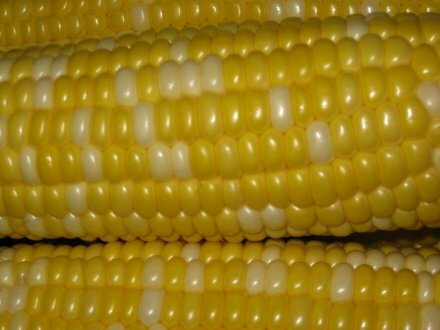 Mmmmm that picture looks delicious - I can almost taste the sweet corn and the way it mixes with a little salt.